More zucchini!! This is a recipe I first made while babysitting for my niece, who was not yet two at the time. She sat at the counter jabbering away, while I chopped and cooked, close enough to catch her and far enough away to keep her hands a safe distance from the stove. That night we made up an awesome call-and-response scatting game. She would blab something that obviously made sense to her, but sounded like nonsense to me, so I’d sing it back to her like Ella Fitzgerald. Pretty soon, we were taking turns making up silly little songs and giggling like crazy people. Then, in a flash, dinner was ready. Bipidy do da wah! 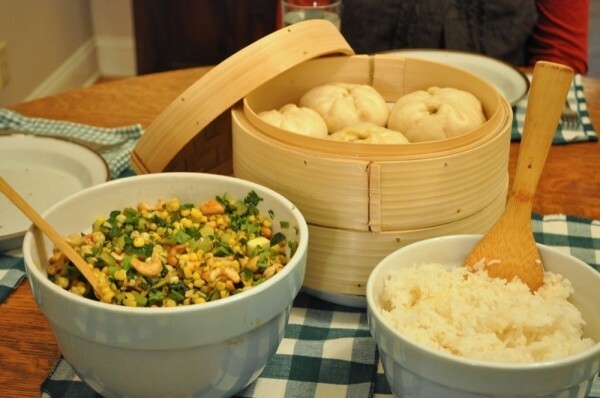 The next time we made this, we were visiting my parents in Minnesota and cooking for them and some friends. One of the friends is vegetarian and the other is a trained chef. No pressure, though. We had also just gone to the State Fair, so we were in dire need of vegetables. Luckily, my parents have a CSA and they had plenty of fresh stuff hanging around. Everyone loved this, even the skeptical meat-eaters of the group. When we made this last time, there wasn’t any scatting or anyone to impress. Just a hungry Erik and Lindsay and TONS of corn and zucchini to use up. Much less of a story. If you want to make it more “Food Network”, add rice, steamed buns, and dessert. It doesn’t need any of that stuff, but sometimes it’s fun to go nuts. 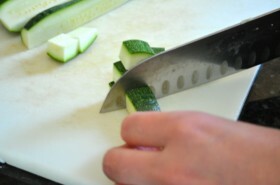 This method of dicing zucchini is a little unorthodox, but it gives you the “meat” of the zucchini without the seeds. 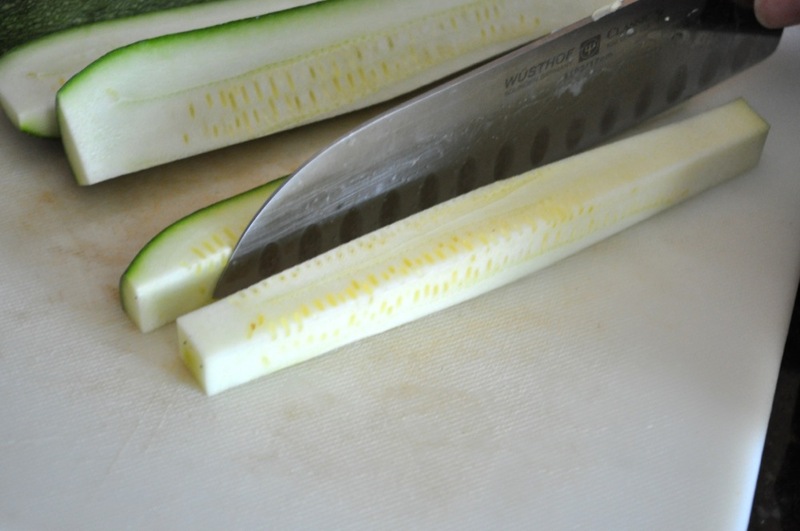 Cut both ends off the zucchini. Cut panels off of all four sides, leaving a brick of seeds, which you can discard. Dice the panels into about 1/2-inch pieces. Repeat with the remaining zucchini. 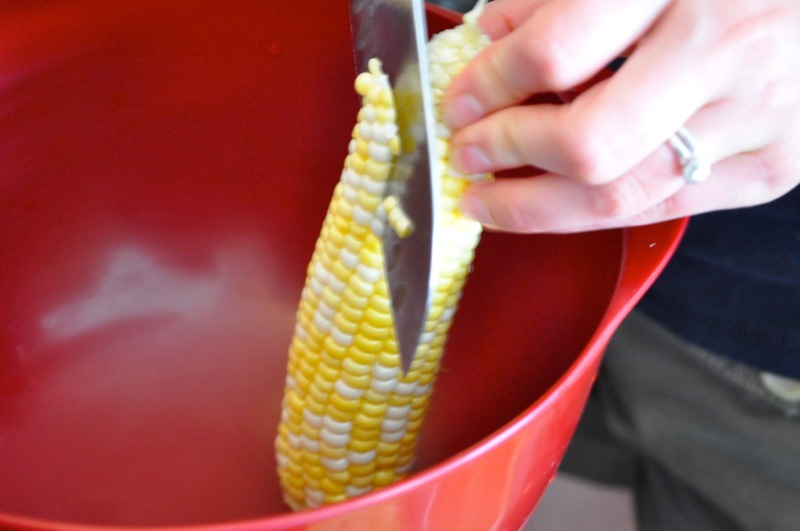 Slice the corn off of the cobs. If you go too close to the cob, you’ll dull your knife, so it’s okay to leave a little of the kernel behind. I find it easiest to cut right in a big bowl, so that the kernels don’t fly all over the kitchen. 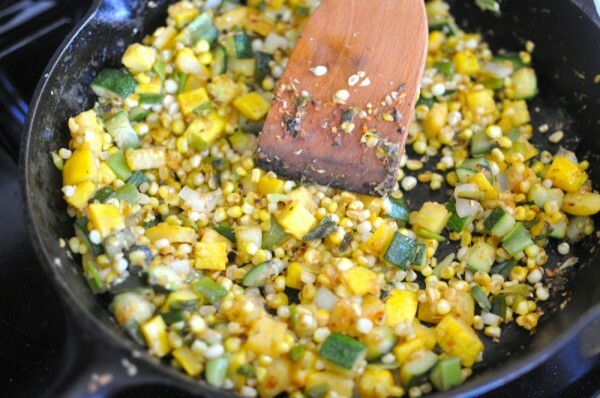 Add the corn to the zucchini. Slice the scallions into 1/2-inch pieces. Use both the white and green parts. Add the scallions to the corn and zucchini. Chop up the mint and cilantro and set aside. Finely chop the garlic. You could also grate it, if you’re feeling fancy. Add it to a small bowl with the grated ginger and chili-garlic sauce. Whisk the hoisin sauce, fish sauce, lime juice, and 1 tsp of water together in a small bowl. Heat 1 TBsp of the sunflower oil in a large skillet or wok over medium heat. When the oil is hot (hold your hand an inch or so above it to test), add the cashews and stir them around until they’re browned in spots (about 3 minutes). Don’t walk away, because they’ll go from perfect to burned rather quickly. Remove them from the pan and set aside. Heat the remaining 1 TBsp of oil and let it heat up over a high flame. Add the zucchini, corn, scallions, and salt. This part will take about 5 minutes. Leave it alone at first, but stir more toward the end. 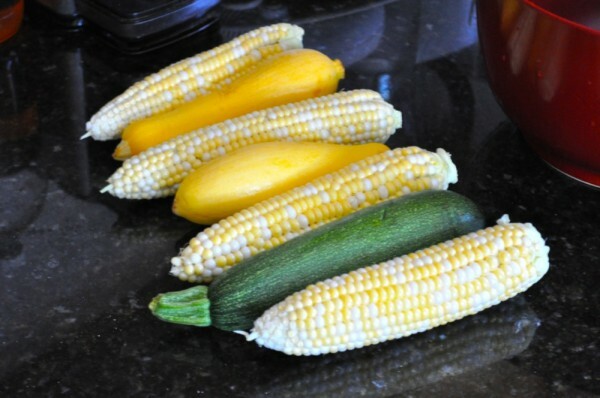 The veggies should be browned in spots and the zucchini should be soft and translucent. Stir in the ginger-garlic mixture and fry for about 30 seconds (you’ll be able to smell it). Take the pan off the heat and stir in the hoisin sauce mixture. 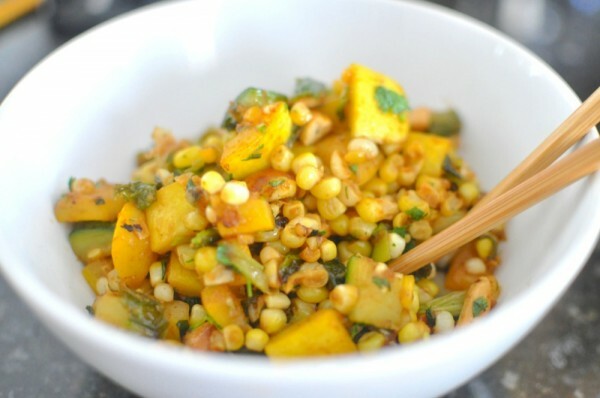 Stir in the cashews, mint, and cilantro and serve. If you’re not serving it right away, transfer the stir-fry to a plate so that it doesn’t continue to cook and get mushy.